Victoria Highlanders FC (1-3-0) captured all three points against Lane United FC(1-2-0), May 25th at Centennial Stadium to earn their first win of the Premier Development League (PDL) season. Striker Cory Bent opened scoring in the match for his first of the year, while goalkeeper Nolan Wirth recorded his first clean sheet. 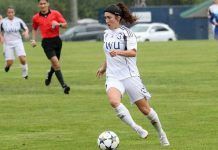 The Highlanders began Friday’s game versus aiming to collect their first win of the 2018 season, while Lane arrived in Victoria hoping to execute their game plan to perfection and steal three points. Lane applied pressure early, resulting in a select number of chances that were ultimately closed down by the Highlanders back line. The return of second-year Highlander Owen Pearce into the midfield was evident with a strong showing throughout the opening 45-minutes. Lane United looked to catch Highlanders off guard at home with continuous high pressure throughout the half but were unable to find a way past Highlander’s netminder Nolan Wirth. On 38-minutes, Lane United found themselves with a great opportunity, stopped by Victoria’s goalkeeper Nolan Wirth. Till the end of the half Lane United continued to mount pressure on the Highlanders. Nearing halftime the Highlanders continued to search for a way through Lane’s organized lineup. Lane United ended the half with more clear chances, while the Highlanders entered half expecting to turn things around in the second half. Highlanders began the second half with a bright start in the 48th minute with their first goal of the season. Peter Schaale made a darting run down the right wing sending a driven ball through to Bent to smash it away for the 1-0 lead. Highlanders found their form following the season opening goal. On 58-minutes Bent continued to create havoc for Lane United’s backline, working through Lane’s backline but unable to capitalize. The midfield continued to be a fiercely contested matchup between the two PDL sides. Victoria’s Marcus Campanile and Owen Pearce were notable through 90-minutes. At the end of a hard fought 90-minutes, Highlanders were able to hold a strong Lane United side to a clean sheet earning their first three points of the season. The Highlanders are back in action this Sunday May 27th at Centennial Stadium. Kick Off is at 2:00 PM.